Wasting no time on the back of July's successful World Youth Day in Sydney, and with a big eye onto the next edition of the church's "Olympic event" at Madrid in 2011, this morning the Holy See rolled out the Pope's chosen theme for Spain's second global WYD: "Rooted and built up in Jesus Christ, firm in the faith." 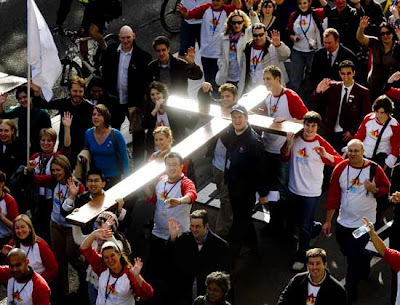 While the triennial gathering tends to dominate the scene, World Youth Day is actually an annual event observed in local churches either on Palm Sunday or another date determined by the episcopal conference (in the US, that'd be the 30th Sunday in Ordinary Time). To that end, the themes for 2009 -- "We have set our hope on the living God" -- and 2010 -- "Good Teacher, what must I do to inherit eternal life?" -- were likewise revealed. Slated to take up the entire third week of August 2011, interest in the Madrid gathering is already running quite high... and as further proof that Karol Wojtyla's beloved brainchild is here to stay, the jockeying for its 2014 follow-up has already begun in earnest. The Pope on "Herr Professor"